Typically, engineers rely heavily on Chapter K of AISC 360 for design guidance for HSS connection designs. However, there are many additional resources available including additional design examples and principles which are not referenced or included in AISC 360. In the January 2019 SE University session, Brad Fletcher, SE, from Atlas Tube, gave a presentation on HSS Truss Connections: The Ts, Ks, and Ys of It All. Brad reviewed ways that HSS truss joint configurations affects the strength and stiffness of the overall truss, as well as how the fabrications costs of the truss relate to the truss joints connections and details. Brad offered several resources for the design of steel trusses, connections, and multi-planar trusses. Of course, AISC 360 offers design guidance in Chapter K for HSS connections, however AISC Design Guide 24 adds further insight for HSS connection design. Brad noted this design guide will be enhanced and released again later this year. CIDECT (International Committee for the Development and Study of Tubular Structures) also offers great examples and principles which may not be covered in the AISC design guides. The 9 CIDECT design guides are available for free download on the AISC website, and further support can be found directly from CIDECT. Steel Tube Institute also offers several online tools as well as HSS Design Manuals. These online tools include spreadsheets as well as HSS CONNEX which code checks your joint configuration. Some items are available for free to members while others may be purchased without membership. Having and using these additional resources can give an engineers more insight into the intricacies of HSS joints and connection design which can help to increase truss strength and stiffness while minimizing fabrication costs. Online tools are especially helpful to code check individual connections and save valuable design time on your next project. When designing trusses, do you often include joint connections in the main design, or is it more an afterthought once the main structural members are selected based on strength? Often times, engineers will focus on minimizing the weight of the truss members, without regard to the joint design details, and this can prove to be a costly error. 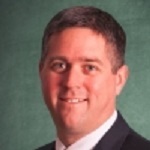 In the January 2019 SE University session, Brad Fletcher, SE, from Atlas Tube, gave a presentation on HSS Truss Connections: The Ts, Ks, and Ys of It All. 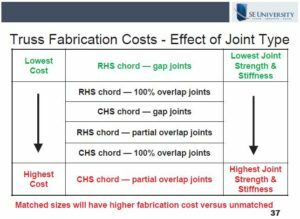 Brad reviewed ways that HSS truss joint configurations affects the strength and stiffness of the overall truss, as well as how the fabrications costs of the truss relate to the truss joints rather than simply the overall weight of the truss. Brad highlighted some important rules of thumb which can be used to design efficient trusses. As a general rule, Brad suggested aiming to design chord members to be relatively stocky (low D/t or B/t) while branch members should have a larger diameter, but thinner walls (high D/t or B/t). Using this recommendation, you can avoid “thick to thin” welding and an added benefit of less surface area at the chord to reduce painting costs. 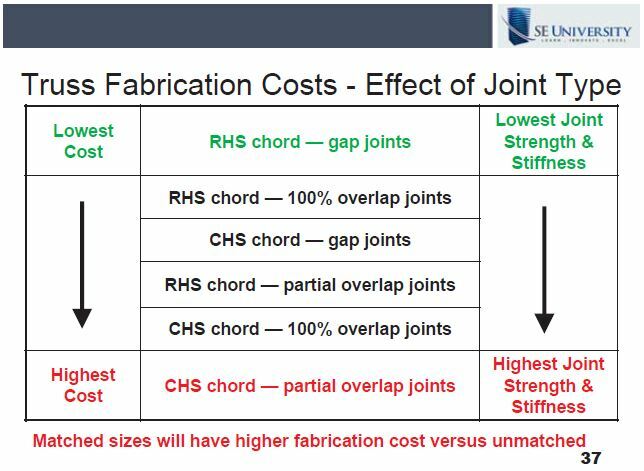 Brad also offered some additional pointers to keep fabrication costs low, as shown in the slide below. As he points out, engineers often focus only on reducing the steel tonnage of their trusses, however, there are many ways to design a less costly truss by considering the joints specifically when designing the overall truss. 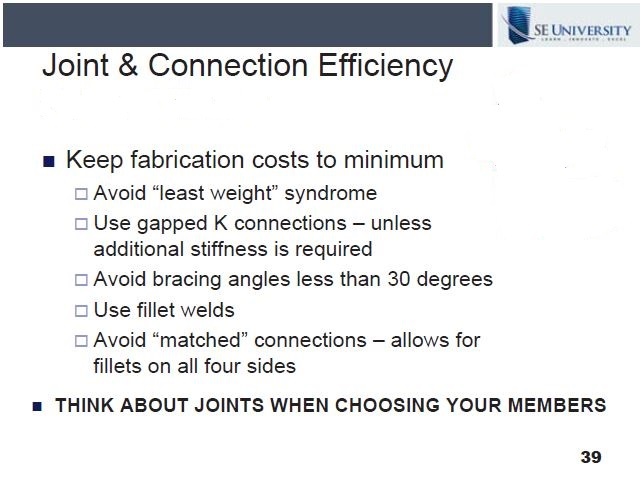 When a more costly truss connection is necessary to improve strength or stiffness values, Brad offered the following step-wise approach to consider costs while improving strength. As you can see in the slide, using Rectangular Hollow Section chords with gap joints have the lowest costs and lowest strength and stiffness values, while Circular Hollow Section chords with partial overlap joints have the highest costs and highest strength and stiffness values. 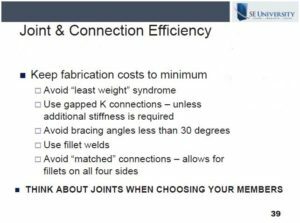 Taking steps to avoid costly Complete Joint Penetration welds and overlapped joints can often save more than solely minimizing the overall chord and web member sizes. These guidelines presented are a great starting point to begin an efficient design which considers the effect of joint configuration on the cost of the truss. Are you familiar with the changes to the wind provisions in ASCE 7-16? If you’ve taken the time to look at the wind maps, you may have noticed some significant changes to the contours and wind speed, but there are other changes that will affect your daily designs within the wind provisions. It is important to not only know what has changed, but why the changes were made. In November 2018, Don Scott, SE, from PCS Structural Solutions, presented ASCE 7-16 Wind Provisions – Changes Affecting the Design Provisions. Don covered the changes to the new wind speed maps and explained how to determine the design wind speed. He also presented the changes to the roof pressure coefficients, and explained the effects of the new Elevation Factor. Don was able to provide much insight as to what went into the changes to the wind speed maps and roof pressure coefficients. Since ASCE had not made changes to the non-hurricane wind speeds since 7-95, there was a significant increase in new anemometer locations and data gained from these locations. The new maps now reflect more regional variability in extreme wind climates. Wind speeds in the great plains remain unchanged, but for the rest of the country wind speeds have decreased, most significantly along the west coast. Also, new hurricane models have reduced the hurricane winds along the northeast coast, while the hurricane winds along the southeast coastlines remain unchanged. Don offered two permitted web based tools that may be used to access wind speed data for various locations in the United States. The first option is the Applied Technology Council’s (ATC) WINDSPEED BY LOCATION website which available free of charge. The second option is ASCE 7 HAZARD TOOL which is available to registered members. This tool provides all design parameters specified by ASCE 7-16 for a given site. While most of the country will appreciate some wind pressure reductions, there will be more regional variability nationwide than in previous editions of ASCE7 due to the new wind map contours. Overall, the new improvements made to the ASCE 7-16 wind provisions will result in more accurate reflections of the wind speeds being witnessed at various anemometer locations throughout the United States. How often have you procrastinated tracking your billable time until the end of the day only to forget the exact time spent with each project? Accurately billing your time is not only important to your employer, but can also be an ethical issue for the client. Keeping good records of your time throughout the day is the best way to help your employer determine which projects are successful financially and which projects might be at risk to lose money. Constant vigilance is the best approach to record keeping. No doubt most employers require some type of automated timekeeping system, however, using these systems throughout the day may prove too labor intensive to be efficient. One way to begin the process of accurately tracking your time may be to keep a journal to quickly write in tasks as they appear throughout the day. This will be separate from any electronic calendar you may use, as tasks often crop up that are not pre-planned but may require immediate attention. Quickly jot down each task and time spent at natural transitions throughout the day such as at the end of a phone call or the completion of a meeting. Journals are also convenient to take with you when leaving the office for visits to the job site and are useful to jot down mileage as well as travel time. At the end of the day, you can access your automated timekeeping system to enter each project’s billable time. Be consistent, and your new record keeping habit will become second nature. Be on the lookout for tasks that typically go overlooked such as writing emails, client phone calls, or overrun meetings. Since these items tend to be more unexpected, it is often hard to track the exact time spent, however, being vigilant at the end of each task will more accurately capture how much time is truly spent on these small, but significant tasks. Every employer will appreciate this extra effort made to accurately recount your billable activity.